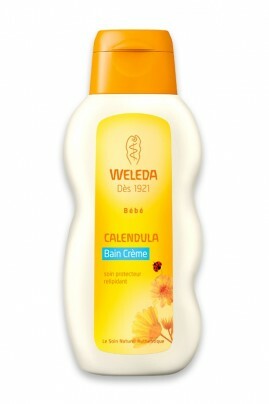 Weleda Baby Calendula Cream Bath is an all natural baby wash that gently cleanses and cares for delicate skin. It is a calming addition to bath time that nurtures your baby’s sensitive skin and ensures that essential moisture is protected. Organic calendula flower extract in our all natural baby wash soothe and soften your baby’s skin, wrapping your child in a layer of warmth and protection like a loving hug. Weleda Baby Calendula Cream Bath contains a base of sweet almond oil and beeswax that help your baby’s skin retain its moisture and keeps it soft and smooth. Tested under dermatologist control. Free of conservatives such as parabens, chemical colorants and perfumes, mineral oils. Not tested on animals. Add a couple drops of Weleda Baby Calendula Cream Bath to the water and mix with your hand. The water temperature should be close to 37 degrees. If you are giving your child a shower, use Weleda Baby Calendula Shampoo & Body Wash. Then apply Weleda Baby Oil or Body Lotion. Water (Aqua), Prunus Amygdalus Dulcis (Sweet Almond) Oil, Sesamum Indicum (Sesame) Seed Oil, Alcohol, Glycerin, Glyceryl Oleate, Calendula Officinalis Flower Extract, Sodium Beeswax, Xanthan Gum, Fragrance (Parfum)*, Limonene*, Linalool*.